Octomore 6.1 is the latest release of Bruichladdich whisky that is made from the most heavily peated barley in the world, and apparently weights in at an official 167ppm. On paper this heavy weight certainly sounds like an aggressive one dimensional slugger that has been torn down by peat, but the nose and palate tell a different story. A sniff and taste of Octomore 6.1 reveals a superbly well balanced and complex whisky that has the signature punch of peat, but in its arsenal of ducks and weaves it offers something completely different (just had a flash back to Monty Python!). Octomore 6.1 offers so much more than peat. It provokes wonder at the way the most heavily peated whisky in the world bottled at 57% and aged only 5 years can be so well balanced and complex! 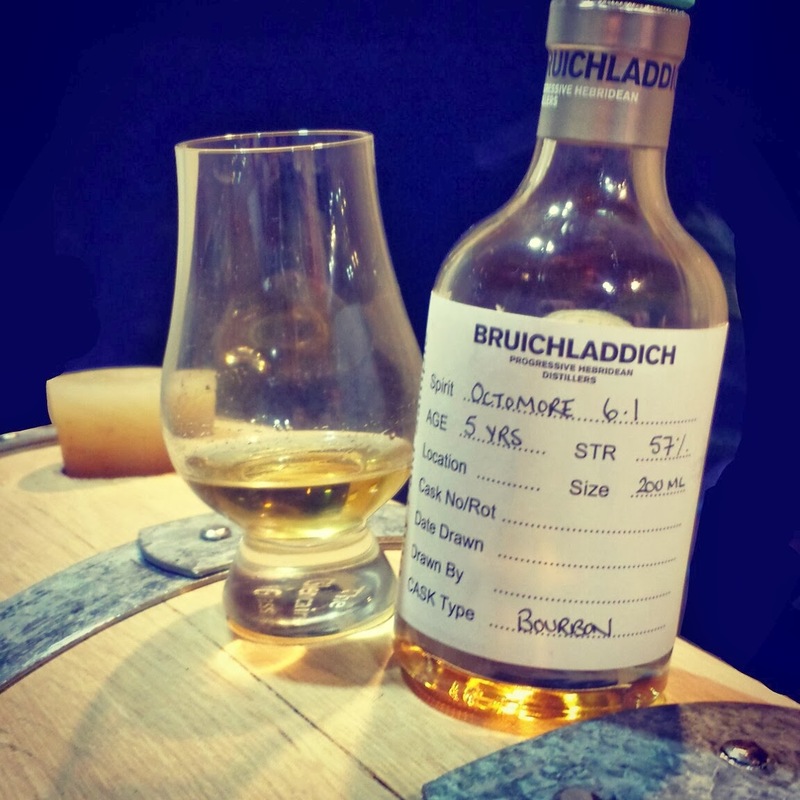 Bruichladdich pride themselves on being progressive, and the Octmore 6.1 is a fine example that a young peated whisky can be just as good (if not better) than a whisky two, five and even ten times its age. What I especially love about this whisky is its impeccable balance and distinctive sweet quality unhindered by heavy maritime or medicinal notes often seen in other expressions from Islay – the bourbon cask influence of vanilla, sweet dried fruit and mild dusty chocolate shines and counteracts the storm of dense peat, salt and vinegary peppers that emerge with undercurrents of cured meat and the most curious but delightful cheese notes. This is a beautifully integrated whisky that offers so much more than peat smoke. The peat merely orchestrates an incredibly complex show. Nose: The peat, interlaced with hints of sea spray, faint betadine, hot peppers, barley and dashes of brown vinegar, is softened by sweet vanilla pod seasoned malt loaf, dark fruit cake (with dried figs, raisin and apricot), honeyed oats, the mild flicker of stout and the caramel infused chocolate of a Mars bar. The fresh aroma of a recently emptied oyster shell sitting on crushed ice also flickers with salty cheese (Pecorino Romano, feta and blue cheese come to mind). There is something about the way the peat and sea salt work with the creamy vanilla undertones and bourbon rich foundation to create what resembles a crumbly and creamy blue vein with salty feta (which, incidentally, can be made with sea salt) over a fruit rich bread. Just imagine that by the sea and you have, in my opinion, something descriptive of the smell of the Octomore 6.1. Taste: The bouquet deceptively promised complexity, softness and finesse, but as this whisky hits the palate it bursts into a raging storm of peat and sea salted sweet vinegar peppers with big chunks of cubed prosciutto. At mid-palate the storm suddenly calms, allowing the flicker of barley and dusty dark chocolate covered dates to add sweetness with dried fig and fresh musky unsweetened vanilla pod. Finish: Drying, the bourbon cask sweetness and cured meat saltiness gradually intensify and then fade with the dying peat, leaving the aftertaste of blue cheese and brie skin.